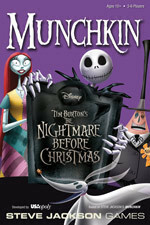 Daily Illuminator: Celebrate Halloween With Munchkin The Nightmare Before Christmas! October 30, 2015: Celebrate Halloween With Munchkin The Nightmare Before Christmas! Would you like to be a Citizen of Halloween Town? With the new Munchkin The Nightmare Before Christmas, published by our friends at USAopoly, you can become a citizen of Halloween Town, Christmas Town, Thanksgiving Town, or Easter Town! Citizenship is a new type of Munchkin card created for this latest Munchkin game, and since tomorrow is Halloween, there's no better time to join your friends and level up! You can grab a copy of Munchkin The Nightmare Before Christmas and host your own party, or join one of the retail stores listed below on Halloween and show everyone at the event your inner munchkin!